I’ll never forget going home to Pensacola,Fla. in the summer of 2010, desperate to enjoy the last days of the pristine white beaches. The BP oil spill had yet to be capped, and I knew it was just a matter of time before the emerald waves I surfed would be brown, tainted with oil. I paddled out sometime in May and saw a little tar ball cling to my board. Tears rushed to my face: it was here. There had to be something we could do. This couldn’t be the end of our lifestyle, our beach and Pensacola’s economic savior. My brother was on the verge of losing his job at a local gulf seafood restaurant. If the beaches were destroyed, the humble city of Pensacola may have turned into a ghost town. 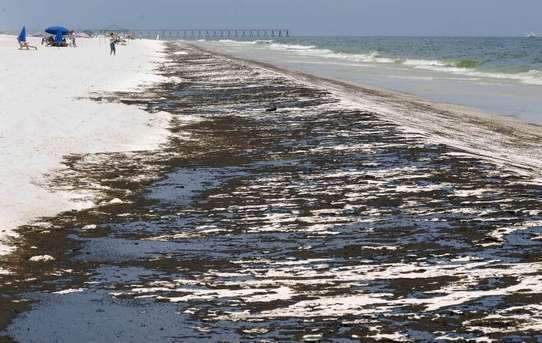 Now, while the beaches are clean today, there is no doubt that the mass of oil that spilled unforgivably into the Gulf of Mexico had irreversible damage to the marine life. This was demonstrated in news reports that dolphins washed ashore: dead. And while the BP oil spill received a lot of media attention, that couldn’t have helped the tourism economy of any of the Gulf coast cities, a new study shows that oil spills occur everyday, and if our seas are going to survive, a more eco-friendly oil is needed. According to the National Research Council, about 500 million gallons of petroleum-based oil seeps into the world’s oceans each year. The source: ship maintenance and used engine oils are being dumped down the drain. These carelessly discarded oils are equivalent to four Exxon Valdez oil spills a month, or enough oil to fill 500 swimming pools. The National Academy of Science said that rivers and storm-water streams are the biggest source of oil to the oceans. The EPA also reported that out of the 2.5 billion gallons of petroleum sold, about 1 billion gallons are wasted, and somehow end up in our water supply. This growing concern has led USDA researchers to find a new, safer oil that will not harm the oceans. They are working exclusively with Biosynthetic Technologies (BT), a cleantech company located in Southern California to market a plant-based oil that is biodegradable and renewable, not to mention non-toxic. “You can expect to see these products on the shelf in 2013 under the brand names you already know. For further information you can visit the company’s website at www.biosynthetic.com or email info@biosynthetic.com,” said the USDA’s press release. My next question: will producing plant-based oil challenge food security in any way? Wow, scary stuff but the work the USDA is doing sounds promising. I justed saw a new youtube video on this same topic.